Revolutionary balladeer Gadar on Friday sprung a surprise by meeting Sonia Gandhi and Rahul Gandhi in New Delhi, less than two months before the Assembly elections in Telangana. 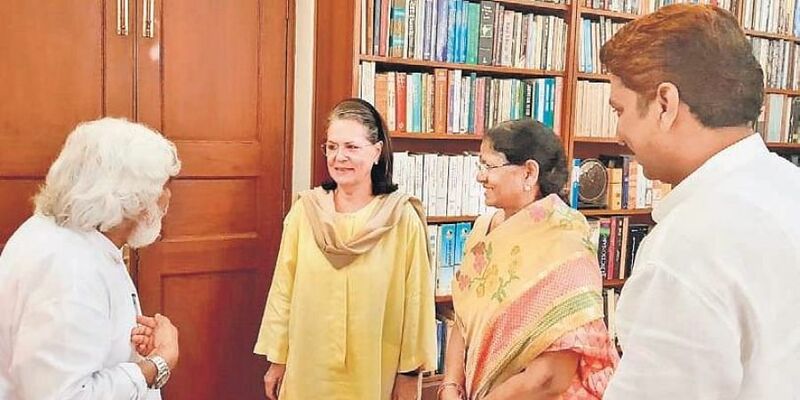 HYDERABAD: Revolutionary balladeer Gadar on Friday sprung a surprise by meeting Sonia Gandhi and Rahul Gandhi in New Delhi, less than two months before the Assembly elections in Telangana. Gadar, along with his wife and son, met with the Gandhis along with AICC SC Cell chief Koppula Raju and AICC secretary Madhu Yashki Goud. Addressing media persons after the meetings, the balladeer said, “Rahul Gandhi has been striving to save democracy. He recently launched a campaign called ‘Save the Constitution’. Rahul explained about the movement and its importance to me. I will lend my support to him wholeheartedly.” Gadar also said he would fight against the ‘feudal rule’ in Telangana. “I always considered myself above electoral politics, but now, on request from Opposition parties, I have decided to contest from Gajwel against KCR,” he said. Though Gadar expressed his readiness to join hands with Congress and campaign against TRS, he did not join the party as was speculated by many in political circles. It may be recalled here that Gadar’s son G Surya Kiran is a Congress member. “Most of the discussions between Rahul Gandhi and Gadar were on the initiatives to save the Constitution and democracy. Assembly elections in Telangana did not even come up for discussion,” said AICC secretary Madhu Goud Yaskhi, speaking to Express. Both Gadar & Congress leaders tried to not assign any immediate electoral significance to the meetings. It is learnt that meetings were part of Congress’ strategy of bringing all of KCR’s opponents under a single umbrella ahead of Assembly polls.